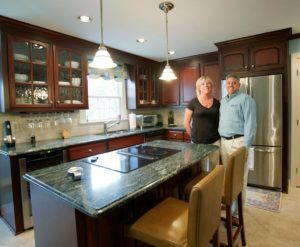 Your kitchen remodeling project mustn't end with just cabinet doors and countertops! Get that electrical situation dealt with at last. Or perhaps there’s a hole that has been bothering you down the basement stairs. We can address these issues as well. No matter what remodeling or renovation project you need here in the Richmond, VA area, chances are we can help you. For example, we have more than a decade of experience repairing and installing recess lighting fixtures, doors, windows, drywall, and kitchen cabinets; we also paint interior rooms, remove wall paper, and repair and install plumbing fixtures. Install appliances, gas ranges, dishwashers, etc. Get everything in working order! Call Brite Kitchen Refacing today at 804-370-7454 to have all your little to-dos fixed.